Today I finished reading iPhone Photography: How to Shoot, Edit and Share Excellent Photographs by Misho Baranovic. Misho is an acclaimed Australian street photographer who teaches iPhone photography workshops and whose photos have been featured in photography exhibitions internationally. Since iPhone photography is such a recent phenomenon, there aren’t many books about it yet. However from the few iPhone Photography books that I’ve come across so far, this one is arguably the best. This eBook is organized into three main sections: shooting, editing and sharing. Each section starts from the very basics (such as using the built-in camera app), and eventually goes into the advanced topics. Text is always complemented with photos and app screenshots. I immediately noticed that this eBook is very condensed and well-written. You won’t find long paragraphs that are filled with fluff. The larger part of this 103-page eBook consists of lists of concise but practically applicable photography tips. About 25% of the book consists of interviews with other renowned iPhone photographers who share their own insights and techniques. This is particularly useful since each iPhone photographer has his own distinct style and techniques that you can learn from. At the end of each topic, Misho provides links to useful external resources. For example after discussing the merits of ProCamera app, there is a link to a video in which Misho demonstrates its features in one of his photography workshops. My favorite part of the book was the shooting chapter, which was also where I learned the most. By showing how focus should be separated from exposure in many different situations, Misho was able to convince me to switch to a third-party camera replacement app. Until now I’ve been taking most of my photos with the less-capable built-in camera. I also learned new things about zone focusing and taking low-light photos. I usually tend to avoid low-light scenes with my iPhone, but after seeing what Misho has been able to do in such situations, I now feel inspired to take more low-light photos. Other topics that are covered in great detail include street photography, landscape photography, portraits and natural light, taking photos of your family, travel photography, applying different filters and even using advanced curve-based photo apps like Filterstorm. Sharing and the community aspects of iPhoneography are discussed as well, but those of you who are already using Instagram probably won’t learn too much from this section. While in general this book is very comprehensive, a few things could be explained in more detail. In particular, the editing section doesn’t go into too much detail. It feels like Misho intentionally leaves some things for you to explore on your own. Another notable omission is the use of third-party accessories. I would agree that iPhone photography is all about simplicity and that carrying around tripods and external lenses defeats the purpose of mobile photography. However, if you’re hoping to learn about such accessories, you won’t find it in this book. 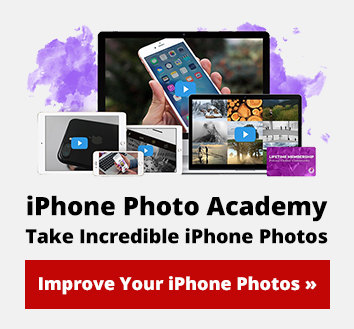 Overall this eBook is a very comprehensive guide to iPhone photography that covers most aspects of this new and exciting genre. Even if you’ve never done any serious iPhoneography before, this book will help you dramatically improve your iPhone photos. Probably the only real drawback of this eBook is its price. At $19.99 it is somewhat expensive for a digital download. However, if you are serious about iPhone photography, this book will certainly be worth it. If you follow Misho’s tips your photos will improve dramatically. Even though I consider myself an experienced iPhoneographer, I still learned a lot from this book. This e-book is available for download as a PDF and EPUB file (you get a link to both with your purchase). While both formats can be used on a variety of devices, the looks and formatting of the PDF version are far superior. I read this book on my iPad, which was a superb experience, but it would also look great on any computer screen. I also tried opening it on my iPhone, but as you would expect, its screen was too small for comfortable reading. It’s also a good idea to keep your iPhone free so that you can try out the apps and techniques as you read.